Yesterday I had the ill fortune to be sick. Really sick. As I lay in bed, I came to realize how much I appreciated really simple things at that moment. I loved the coziness of the quilt that I lay under, the one that my mother bought me. I felt less alone because my two cats were curled around me. I was grateful for the gorgeous view that I could see outside my bedroom window. I was thankful for the telephone calls I received from people who were checking up on me. Today's picture poetry book explores a few everyday things as seen through the eyes of three children, and it is a celebration of those simple things that make life better and happier. Throughout the day, we have these little moments when we use or encounter everyday objects and things, and we don’t even think about the experience. When was the last time that you thought about your toothbrush and what it does for you? Have you ever considered how useful your cup is as it conveys your breakfast juice to your mouth? Have you ever contemplated the perfection of a hotdog in its bun, dressed with mustard, relish, and ketchup? Probably not. In this book, you can follow three friends as they play, run, swim, and make their way through a day. You are there when they wake up, and you are there when they finally fall asleep. Best of all, you will connect with these children as they talk about some of the simple things that make their lives better. Their words come to us in the form of poems, each one being written as if the girl or one of the two boys is speaking to us. The day begins with a little boy brushing his teeth. As he brushes, he ‘converses’ with his toothbrush. The boy talks about how he gives the toothbrush “toothpaste / for breakfast,” and how in turn, the toothbrush works hard “scouring and scrubbing” his teeth. Next, we meet a little boy who loves his pants. After all, the little boy and his pants “go everywhere / together.” The pants carry the little boy’s “treasures” in pockets, and together they share all kinds of adventures. Of course, it is very hard for the pants to endure being washed, but as soon as the clean “limp and lifeless” garment is worn again, it comes back to life. The poems that follow look at toes, socks, shoes, water, summer sun, rain, books, and many other things that we connect with and experience on a typical day. Each poem is rich with images that children will recognize and enjoy, and each one celebrates those simple yet precious everyday moments. 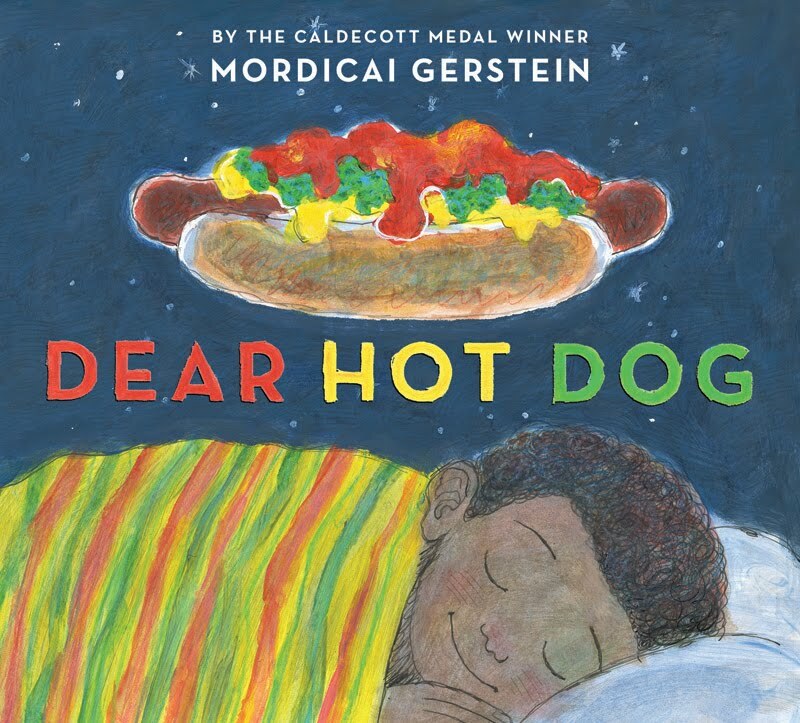 Paired with his delightful artwork, Mordecai Gerstein’s collection of poems is a treat to read and to look at, and children will enjoy dipping into the book to see what new treasures they can find. Heroes come in all shapes and sizes, and sometimes the most unlikely looking characters turn out to be the only ones who can save the day when something goes horribly wrong. In today's picture book, you will meet a cat who does not look like he can do much of anything, except raid the nearest garbage can. Thankfully, it turns out that he has inner resources that are very valuable indeed. One evening Warduff the cat is having a post snack snooze when he is woken up by a telephone call. Fefferflap the goose from Corncob Farm is on the other end of the line, and he is in a flap because the local fox is apparently coming to dinner. Fefferflap and the other animals at the farm don’t want to be on the menu. Warduff is large and not exactly beautiful, but he is loyal to his friends, and soon he is at the farm, listening to the farm animals who desperately need his help. Warduff tells the animals to calm down, and then he goes into one of the fields where he thinks and thinks until a cunning plan comes into his head. Soon Operation Corncob is under way. Young readers will greatly enjoy seeing how Warduff the cat works on finding a way to save his farm friends from a hungry fox. They will see how important it is to cooperate with others when there is danger ahead. Even the smallest and weakest amongst us can defeat a bigger foe if we work together. With wonderfully expressive illustrations and a clever story, this is a picture book that is sure to become a firm favorite with children who like a happy ending. 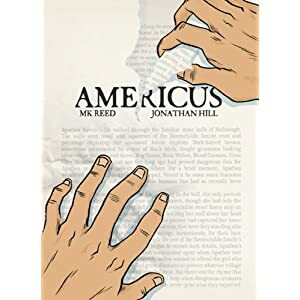 This is banned books week, and in honor of this important week, I have a review of Americus, a graphic novel that shows, in a fictional setting, how banning some books affects young readers. This is an extraordinary book, one that readers of all ages should read. For Neil Barton and his friend Danny Burns, life in the little town of Americus is not much fun. Neil and Danny just want to be left alone, and one of the few things that they can do to escape their lives it to read. In particular, the boys share a love of a fantasy series, which is about a character called Apathea Ravenchilde. The boys are coping pretty well considering, when Danny’s mother Nancy decides that the newest Apathea book is “wicked.” She takes the book back to the library and rips it up in front of Charlotte, the librarian. Back at home, Danny and his mother have a blazing row, which causes Danny’s parents to send him to military school camp. Neil is now friendless and he is going to have to navigate the perils of junior high alone. Following the removal of her son, Nancy Burns declares war on the Apathea Ravenchilde books. She wants them removed from the public library because she thinks that they glorify witchcraft, violence, and countless other immoral beliefs and behaviors. Neil is appalled and angry. He feels helpless against Mrs. Burns’ religious tirades and her virulent indignation. How can he, a shy, withdrawn, and unpopular boy, do anything to stop the library board from banning the books? In this powerful and sometimes disturbing book, MK Reed and Jonathan Hill explore a very explosive issue, the banning of books in public libraries. Through the eyes of Neil and Danny, we see how the banning of books affects young readers, and we see how important it is to stand up for what you believe in, even if it scares you to do so. I remember many years ago I celebrated my birthday in India. Though I was surrounded by good friends and they certainly arranged a wonderful celebration for me, I could not help missing my family. Today's book is about a little witch who cannot find her dearest companion, just when she is about to celebrate her birthday. Though the little witch has her cake and her decorations, she cannot imagine celebrating her birthday if her best friend is not there with her. It is Lizzy the Little Witch’s birthday, and she is planning a little celebration. When her cake conjuring spell fails to work, she flies out on her broom to buy a cake. Back at home, she puts the cake on the table and calls Cat, but Cat does not respond. Lizzy cannot celebrate without Cat, so she goes to look for her. She asks some witches in the Witch Village Market if they have seen Cat, but they haven’t. The witches in the Witch This-n’-That Shop tell Lizzy that they haven’t seen Cat either. Even the witch in the Witch Pet Store hasn’t seen Cat. Poor Lizzy. How can she have her birthday party without Cat for company. In this delightful Little Witch title, children will enjoy a story that is full of surprises, cunning pictures with doors that open, and that has the perfect happy ending. They will appreciate why Lizzy feels that her birthday celebration cannot be complete if Cat is not there with her. This is one of a series of books about Lizzy the Little Witch. There are some children who think having a bath or a shower is a form of torture. They have to be bribed or threatened before they will reluctantly agree to get clean. Many readers will be amused by today's picture book, but children who are apposed to getting clean will especially appreciate it. Farmer is a very determined sort of man, so he decides to spray some water through a hole in the pig’s pen. If they won’t let him give them a bath, he will give then a shower instead. Unfortunately, the plan backfires. The water makes a ton of mud inside the pen and the pigs get dirtier than ever. Farmer is furious. “You oikers get me riled!” he says in frustration, and he sets about trying to trick his wily pigs into getting clean. With a delicious rhyming text and amusing illustrations, this book is perfect for children who are bathaphobic. They are sure to appreciate this clever and outrageously funny story, and will surely find themselves rooting for the pigs. Many of us have wishes that we wish would come true. We drop pennies into wells, wish on rainbows and on the first star that we see in the evening, and we hope that we will find the lucky coin in the Christmas pudding. Most of the time our wishes don't come true, but every so often they do. In today's picture book you will meet two little children who really do need to have a few of their wishes granted, and you will meet a cat who likes nothing better than to grant wishes. When he hears this, Mr. Zooty gets to work. He takes a shabby coat out of his red suitcase and pretends to be a poor elderly cat who is down on his luck. Though they don’t have any pennies to spare, Lucy does not hesitate to give Mr. Zooty the three lucky leaves, and when he collapses, Lucy, Sam, and their mother take the cat home. After all, “everybody needs a little help sometimes.” Little do they know that Mr. Zooty is going to return their kindnesses in many wonderful ways. Every so often one needs to read a feel-good book, and this picture book is just that. Children will be delighted to see how Mr. Zooty helps the two children and their mother, and they will love the delightfully unique way in which the cat grants wishes. Just before I was born, my parents got a puppy, so I was lucky enough to grow up with a dog in the house. Balloo was a wonderful canine person who taught me a great deal about courage, patience, and unselfish love, and because of her I have never really been afraid of dogs. I do have some friends who are terrified of them, and it is painful to see how afraid they get when a dog walks towards them. Today's picture book tells the story of one little boy who is afraid of dogs, and who discovers something really important about fear. Daniel is not afraid of spiders, or snakes, or thunderstorms, but he is afraid of dogs. Of course, Daniel won’t admit that he is afraid of dogs. He insists that he simply doesn’t like them. Everywhere he goes, Daniel avoids dogs. He climbs the stairs if there is a dog in the elevator, he crosses the street if a dog is walking down the sidewalk, and he leaves the park if a dog is there. One day he comes home to find out that his mother has agreed to take care of Aunt Rose’s dog Bandit. Daniel is furious, and he refuses to come out of his room, even for dinner. That night Daniel has to go to the bathroom. How can he be sure that he won’t encounter Bandit, and what should he do if he does come nose to nose with the little dog? In this charming and sensitively written book, Susanna Pitzer shows her readers how our fears can be crippling, and how they often doesn’t make any sense. Sometimes the thing that we are afraid of is actually not a threat at all. Though it is still warm here in southern Oregon, it is officially fall, so today I have a fall-ish book for you to enjoy. It may be eighty something degrees outside, but in the pages of this book I can experience a day that is cold, blustery, and stormy. How nice! It is fall, and it is time for Mouse to collect nuts so that she has food during the winter months that lie ahead. Wearing her red coat with the big pockets and her warm scarf, Mouse heads across the big field towards the big nut tree that stands near the farm. As Mouse approaches the furrowed field, Gull warns her that a storm is on its way, but his warning is blown away by the wind. In the field, Hare tells Mouse to “Get out of here” or she will get run over by the tractor. Mouse cannot hear Hare’s warning because of the “roar” of the tractor’s engine. In the meadow, Sheep warns Mouse that there is a dog behind her, but the dog’s barking is so loud that Mouse does not hear what Sheep says. When Mouse gets to the nut tree, the storm is so fierce that she takes refuge in a hole at the base of the tree. Snug and safe, she falls asleep. Little does she know that she is going to get a dreadful surprise when she wakes up. In this visually stunning picture book, Paula Gerritsen gives her readers a picture of a blustery autumn day in the country. 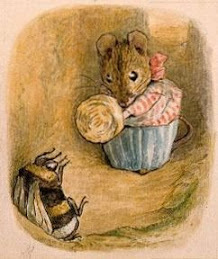 Children get to meet some animals, and they get to follow the adventures of a plucky little mouse, whose plans are greatly upset by a sudden storm. Many people get a lot of pleasure from watching birds. They set up feeders in their gardens or in front of a window, and some people keep a list of all the bird species that they have seen. In today's poetry title, Michael Rosen brings together his love of poetry and his enthusiasm for bird-watching to give readers a delightful reading experience. This is the kind of book that children and adults alike will enjoy. For many of us poems are synonymous with rhymes. We are familiar with poems that have a bouncing rhythm, stanzas, and rhyming words. The thing is that poetry comes in a wide variety of forms. Some don’t rhyme at all, and some, like haikus, are only three lines long. For this book, Michael Rosen has written a collection of beautiful and evocative haikus that look at twenty-four commonly seen American birds. He has organized the haikus by season, showing us the species that we are most likely to see at that time of year. In the summer you are likely to hear the northern mockingbird, that “one man bird band” that can create so many sounds. This is also the time when common grackles can be seen taking sips of water from potholes in the road. This book would make a splendid gift for readers who likes poetry, and for bird lovers of all ages. Happy fall everyone (who is the northern hemisphere)! In honor of the autumnal equinox, I have a picture book that is about fall. Sort of. In a odd sort of way. Most of us know what to expect in the fall. Leaves change color and fall to the ground, animals prepare for the winter by gathering food, flying south, or hibernating, apples turn red, and pumpkins turn orange. Imagine what it would be like if all these things were mixed up. What would fall be like? Well, for a start leaves would “float up into / blue skies overhead.” Bears would gather nuts, geese would hibernate, and squirrels would “fly south in / big figure eights.” Children would leap into piles of sticks instead of into piles of leaves, and they would get “stuffing and / drumsticks for treats” instead of candy on Halloween night. In this topsy-turvy picture book, Bob Raczka’s clever verse is paired with Chad Cameron’s amusing art to give children a book that they can look through again and again, looking for the things that “aren’t right.” There are ‘mistakes’ not only in the art, but in the text as well. There are some people who, try as they might, cannot seem to stay out of trouble. Even when they are endeavoring to avoid trouble, it seems to find them. This picture book for written for the poor souls and it sure to make readers of all ages laugh. After all, who can resist a little dinosaur who tries to wash a dirty rug in a dishwasher! Some little dinosaurs can play nicely together, building creations with their wooden bricks. And then there is the kind of little dinosaur who likes to bounce on the sofa, and who ends up knocking over all the brick creations and a potted plant. Of course the naughty little dinosaur gets into trouble for making a mess, and he is told to sweep up all the plant soil. The problem is that this particular little dinosaur is accident prone, and he knocks a milk jug over with the broom, making another mess. “Uh-Oh!” He had better clean up all that spilled milk. The little dinosaur ends up using a rug to mop up the milk, which he puts into the dishwasher to get clean. Not reading the instructions on the soap container, the little dinosaur adds LOTS of soap to the machine. He gives a sigh of relief, imagining that his troubles are over, but alas they have only just begun. This mostly wordless picture book is sure to amuse young children who are find themselves getting into trouble far too easily. Not only are the dinosaur’s misadventures ridiculously funny, but the story’s ending is quite perfect. Today's picture book is so beautiful and magical that I don't want to waste any time giving you an introduction. Enjoy! As it gets closer, the cloud gets bigger and bigger, and Jilly sees that it is orange in color, not white or gray. It also “shimmers.” Imagining all kinds of things, the girl runs up to the cabin where her mother is loading up the car. Instead of being afraid of the strange cloud, Jilly’s mother rushes down towards the beach. In the woods Jilly and her mother see an orange Baltimore Oriole, and an orange kite, but no orange cloud. What did Jilly see on the beach and where is it now? In this remarkable book, Sandra Markle’s lyrical text is paired with gorgeous paintings to give young readers a singular picture book experience. The author perfectly captures the sense of wonder that Jilly experiences when she finally understands what the orange cloud is, and we can celebrate the fact that she got to share this amazing moment with her mother. At the back of the book, the author provides her readers with further information about the animals that make up Jilly’s orange cloud. Being a confirmed dog lover, I really enjoy reading books that feature dogs in some way. In today's picture you will meet a dog who has a fondness for anything that is red in color. His passion for red objects gets him into trouble, and it also encourages him to be brave and cunning. Raja is a dog who loves red things, and whenever he can, he finds something red and he chews it. One day Raja chews Mr. Lal’s grey and red socks and he is such a nuisance that Tanvi decides to take Raja to the park. Usually Raja and his dog friend Champ play with a red ball, but today the red ball is missing and Champ is very upset because he “can’t find it anywhere.” Raja asks the other animals if they know where the red ball is, but none of them are helpful. Then Raja sees the red ball lying in Mr. Mehta’s garden, which is a truly terrible thing because grumpy Mr. Mehta hates dogs. Somehow Raja has to get the red ball back without getting caught. Young children are sure to enjoy this color filled picture book with its loveable main character. Young readers will find it hard not to cheer for Raja as he does his best to rescue the treasured red ball from the dog hating Mr. Mehta. Many people are attracted to the idea of having an exotic pet. How cool it would be to take a lion for a walk in the park, or to go to school with a snake draped over ones shoulders. The problem is that lions, snakes, monkeys, parrots, and other exotic animals can be a bit unpredictable. In today's picture book you will meet a little boy who has a pet rhino and who discovers that rhinos can be rather unusual animals. One day a boy buys a rhinoceros at an exotic pet shop, and he soon discovers that he really does not know much about rhinos. His pet is “shy” and does not do much. He doesn’t fetch balls, sticks, or Frisbees and he won’t do any tricks. When the boy consults a rhinoceros expert, he learns that rhinos only do two things. They “Pop balloons and poke holes in kites.” Dear me. In the boy’s opinion both of these things are rather “pathetic.” Not only that, but this particular rhinoceros shows no inclination to pop balloons or poke holes in kites. Perhaps the little boy would have been better off with a hippopotamus for a pet. As they read this story, children will laugh out loud when they see how the little boy’s unusual pet finally proves that a rhinoceros is not a boring pet at all. With a simple text and amusing illustrations, this picture book is sure to appeal to children who dream of getting an exotic pet of their own. When I worked in a school I used to greatly enjoy seeing how my students were able to create a magical world out of things that they found in the school yard. A tree with low hanging branches became a pirates cave. A hanging bar became a bridge across a precipice. In today's picture book you will see how a little girl turns an everyday kind of event into a journey that is full of magic and wonder. It is a warm sunny day, and a little girl and her grownup leave their apartment in the “beautiful stone castle,” travel in the “magic box” (the elevator) to the street, and there the little girl sits astride her yellow giraffe (her little wooden scooter). Thus begins a wonderful journey that is full of wondrous people and things. As she travels down the sidewalk, the little girl says hello to all kinds of people. She sees a “wizard” feeding birds and a “magician” juggling colored balls. There are “monsters and dragons” working on the roads, and in the park there are gardens and fountains to play in and other wonders to enjoy. In this delightful picture book, Ronald Himmler shows us how a little girl’s imagination transforms a simple everyday outing to the park into a remarkable journey full of adventures and magical people and creatures. Throughout the book, the simple text is beautifully paired with Ronald Himmler’s expressive artwork. One of my favorite series for little children are the Mole Sisters books. These books are sweet, funny, and the main characters are delightful. Now the author who created the Mole Sisters, Roslyn Schwartz, has created a book about a pair of vole brothers whose gluttony is almost their undoing. The two vole brothers are a pair of eating machines, and they are always hungry. The problem is that though there is food around in their urban home, there is also a cat in the neighborhood who would love a vole snack. One day the voles smell something delicious, and so does the cat. Hiding inside a paper bag, the voles follow the large feline to the source of the smell, and being the wily creatures that they are, they steal a slice of pepperoni pizza that the cat finds in a garbage can. They soon discover that they are not the only creatures around who fancy pizza. First the pepperoni slices are stolen, and then the rest of the pizza is taken by a cohort of militant ants. With empty tummies, the voles wander off bemoaning their foodless state, not realizing that they are being carefully watched. By the cat. Using a comic book style format, Roslyn Schwartz, who created the Mole Sister books, tells a delightfully funny story that will charm young readers. We can only hope that this is just the first in a series of stories about the two voles who have bottomless appetites. Many of us have a favorite piece of clothing that we wear and wear and wear until the fabric is thin and often full of holes. Often these items of clothing have a good story to go with them, or they remind us of a happy or special moment in our lives. In today's picture book, you will meet a little girl who has a favorite dress and who finds a way to keep enjoying the dress long after is has grown too small for her. A girl has a dress that is her “favoritest dress ever.” She wears it every Tuesday (her favorite day of the week), until one Tuesday when she finds out that she has grown too big for the dress. The girl is so upset that she makes a huge fuss. Thankfully, her mother, who is a very wise woman, calms her down and tells not to make “mountains out of molehills.” The little girl’s mama does a little snipping and a little sewing, and she turns the dress into a shirt. The girl is delighted with her shirt, but there comes a time when it too is too small and Mama turns the shirt into a tank top, which is perfect for those hot summer days. In the fall, the girl goes back to school and since tank tops are not allowed at school, her mama turns the top into a skirt. Is this the last incarnation of the much loved dress, or will it keep on going forever? In this delightful picture book, we see how a treasured article of clothing is turned into a shirt, a tank top, a skirt and more. Recycling of this kind is not only environmentally friendly, but it is also creative and a lot of fun, and it allows children to enjoy a much loved treasure for years and years. Throughout the book, a light bouncy text is paired with Julia Denos’ delightful multimedia illustrations, which beautifully capture the adventures the little girl has with her “favoritest” dress. Some poems are thought-provoking and they make you pause and ponder. Others create pictures in your mind that you savor. Then there are the poems that are funny. They make you laugh, and remind you that life is full of silly situations. Today's poetry title is full of poems that will make you chuckle and that young children will greatly enjoy. This book contains more than one hundred poems that children will find amusing and entertaining. Simple line drawings accompany many of the poems, and there is also an audio CD that children can listen to. On the CD, Kenn Nesbitt reads more than forty of the poems in the book. His narrative is spirited, and young listeners will find it hard to keep a straight face as they listen. Peter H. Reynolds is one of those author illustrators who creates incredible picture books that are powerful and memorable. For today's picture book, I have his latest title, and it has a message that will resonate with all kinds of people, both children and adults. All over the world, there are millions of children who see the world in a different way. They are not part of the big group, and spend much of the time alone because that is easier for them. This book was written for these children, for the youngsters who suffer from Autism spectrum disorders (ASDs), or for those who are different in some other way. Being different can be lonely and when we meet the little boy in this book he is “here” while everyone else is “there.” He sits quietly by himself feeling the wind “patting my head” with its soft touch. The wind carries a piece of paper to the boy and he decides to turn it into a paper plane. When he sends his creation out into the world, the paper plane flies higher and higher carrying the little boy’s dreams with it. Then something wonderful happens and the little boy finds out that he can be “here” with someone else. In this memorable book, Peter H. Reynolds pairs his lovely illustrations with a simple and sensitive text to give readers of all ages a singular reading experience.